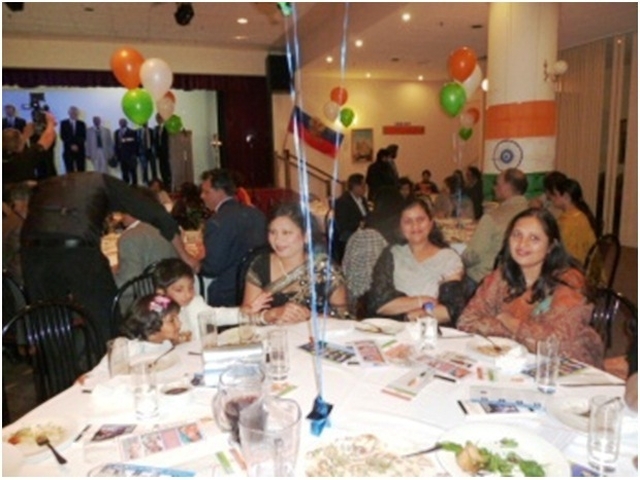 India’s 66th Independence Day was celebrated with great fanfare in Strathfield, Sydney on 15th August 2012. The organizers, Mr. Rajiv Bhandula and Mr. Yateender Gupta chose Ekal as the charity to support on this occasion. The venue, Russian Club was packed with more than 250 people in patriotic mood. The mood was enhanced by rendering of several patriotic songs, some on the beats of a live dhol. Guests were treated with a sumptuous 3-course sit-down dinner. A number of Ekal supporters attended the function. Presentations about Ekal were made by Devendra Gupta, Medhavi Gupta and Srishti Yadav. Devendra provided an overview of the Ekal movement: its philosophy, history, the growth since inception in 1988. He talked about the Australian chapter of Ekal and informed the audience that from just 30 schools in 2004, today we are sponsoring more than 500 schools from Australia. He appealed to the community leaders at the function to help in promoting the Ekal message amongst the wider Australian community. Medhavi shared her experience of visiting an Ekal school with the audience with the help of video clips and photos. She told them about the positive impact that visit has made on her life and urged the guests to visit a school when they visit India. Srishti talked to the audience about the satisfaction she derives from being an Ekal volunteer. She provided details about upcoming Ekal Baltarang function on 7th October (Sunday) at Blacktown, Sydney. Srishti appealed to the guests, especially the youth to become an active part of the Ekal movement. One enthusiastic audience committed to sponsor one school for five years. Ekal thanks the organizers for providing the opportunity to promote the Ekal message and to all volunteers who helped in making this event a success. FTS Coimbatore chapter’s Annual day was celebrated on 24th August 2012 at A.C. Chamber hall, Coimbatore. The programme started with prayer by Ekal children, following the welcome speech by Sri Shreegopal Maheshwary, President of the FTS Coimbatore chapter. After that Guest of Honour Sri Ramesh, President of Ekal Vidyashram addressed the future expansion of the Ekal work in 4000 villages of Tamil Nadu. Then the souvenir was released by the chief guest Sri M.P. Vijaya Kumar I.A.S. (Rtd) and the first copy was received by Padmashri P.R. Krishna Kumar, M.D of Arya Vaidya Pharmacy (Coimbatore) Ltd. Addressing the gathering Chief Guest Sri M.P. Vijaya Kumar talked on importance of education among children. He further said that he would like that the ABL (Activity based learning) method be implemented in all the Ekal Vidyalayas. On this occasion Dr. C. Satheesh Kumar also addressed and informed about the future plans of Ekal Vidyalaya movement. Sri Muralidharan, Secretary, FTS Coimbatore chapter proposed a vote of thanks. Before the programme came to an end vibrant dance performance was given by Ekal children. Finally the event concluded with National Anthem. Aroyga Foundation of India in association with Friends of Tribals Society Bangalore, Vittala Eye Hospital and Have a Hear Foundation, both from Bangalore, had organized a two days free health checkup and eye screening camps in the third week of July at Kotamballi Village, Yelanduru Tq, and Kannuru village, Hannuru Sanch C.H. Nagara districts. Both thses two villages are part of Ekal Movement. Jai Shivashakti Health and Education Foundation sponsored the camps. Post camp eye surgery, cardiac surgery costs will be borne by Jai Shivashakti Health and Education Foundation and Have a Heart Foundation. 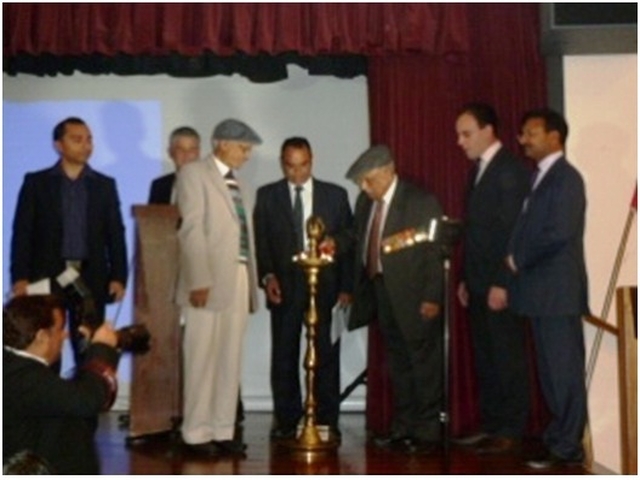 The first camp was inaugurated by Sri K. K. Mallya, Secretary, FTS Bangalore, Smt. Radika K. Mallya, Dr. Vikas, Dr. Chandashekar, Dr. B. Satish, Sri Mahadevappa, SDMC Member, and member of the C.H. Nagar Ancha Anchal committee members were also present Sri K.K Mallya briefed the villagers about the medical camps organized by Arogya Foundation (Ekal) regularly. Six hundred twenty patients were examined. The second camp was held at Kannuru village, a remote village coming under Hannuru cluster. Dr. B. Satish, Dr. Srujana, Village Panchayat Pramukhs and SDMC members also participated in it and 646 patients took advantage of the health services. Two pilot camps of the Arogya Anaemia Control programme were held in tribal areas of UDAIPUR Anchal of Rajasthan on 5th & 6th Aug 2012. Dr Harish Anand and Dr. Sarita Mittal, members of Central Team participated in the camp. The first camp was organized at Bachher Village in Pai Sanch- in Udaipur anchal on 5th August. Four doctors led by Dr. Madhusudan Sharma and Dr. L.N. Srimali participated in the camp. The camp was attended by 285 patients out of whom there were 105 males 95 females and 85 children. Proper Hb testing was done and upto 80% (Hb less than 6-8 g %) of the women are reported to be suffering from moderate Anaemia, 10% were having severe Anaemia (Hb less than 6 g %) and 10% hard mild Anaemia (Hb less than 8-10 g %). The second camp was organized at Madala Village in Bhagpura Sanch on 6th of August. Three doctors led by Dr. R.P. Chawla participated in the camp. 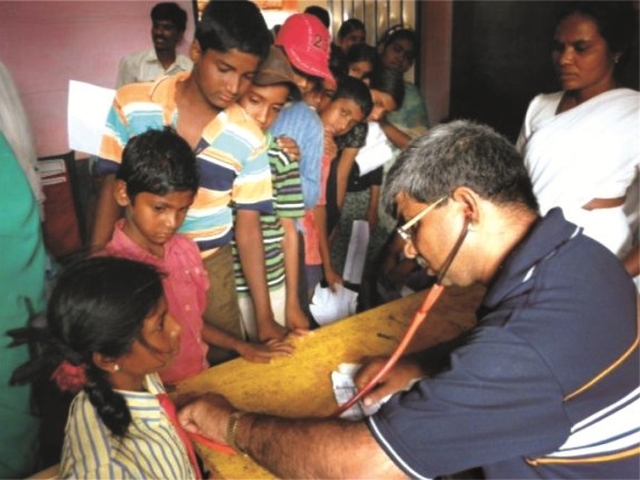 The camp was attended by 265 patients out of whom there were 110 males 95 females and 60 children. Proper Hb testing was done and upto 75% (Hb less than 6-8 g %) of the women are reported to be suffering from moderate Anaemia, 15% were having severe Anaemia (Hb less than 6 g %) and 10% hard mild Anaemia (Hb less than 8-10 g %). Along with medicine for general illnesses, each anaemic woman was administered Albendazole tablet directly on the spot and were given 60 Iron tablets for one month. The children were administered Albendazole syrup. Along with anaemia the other medical problems which were diagnosed and treated included PID, Diarrhoea, pain in abdomen, fever, joint pains and Skin diseases. Dr. Sarita also took Health Talk on hygiene and use of GUR -Chana in diet. The local Angawadi workers and Asha workers were also involved in the camp. After that they shall be given 10 tablets by our Arogya Samity worker for once a day consumption every 10th day. Ms. Diksha and the committee members took the responsibility of distributing the Iron Tablets to anaemic ladies. As per our strategy the camp and Hb testing shall be done every six months. The Rotary Club of The Nilgiris [RI Dist.3202], Coonoor (Andhra Pradesh) visited Ekal Vidyalaya of Bettati village on August 11, 2012 in Ooty Anchal. Last year they adopted the same village and this year they continued to adopt with the support of The Rotary Club of Metz Rive Gauche, France [RI Dist. 1790]. Four persons from the Rotary club namely Mrs. Rohini Parekh, President, Sri Vijaya Kumar Dar, Secretary, Sri Mukund, Sri Jayanthi Lal interacted with the children, teacher and committee members. The visitors were happy to see the activities of Ekal children. “My dear children and teachers of the Ekal Vidyalaya. I wish you all the best for the coming year and all the time that you spend at the centre. It is heart warming to see so much enthusiasm to learn and progress for the future. Best wishes to all of you” said Rohini Parikh. On fine morning of July 11, 2012 we left Delhi for Vanyatra to Ekal Vidyalayas at Kundalka and Sevka villages near Alwar (Rajasthan). After a short stopover at Natural Lake at Siliserh we reached Kundalka (40 kilometers from Alwar) by 3 o’clock- the starting time of Ekal Vidyalaya . Sri Brahm Omji (from New Jersey, USA) and his daughter Anjali were given a traditional welcome by offering garlands and putting tilak. There were about 40 children in the school. Asha was the young teacher taking the class. The children recited Sarasvati Vandana and poems in their regional language. All these activities had given them a true picture about the actual working of Vidyalayas and the Ekal Movement. Interaction with the school children and the village elders was a new experience for them. These are the small efforts of Ekal Movement to reach Bharat. We reached Sevka village by 4:30 which was at a distance of 3 kilometres from Kundalka. The villagers welcomed the Vanyatrees by putting phatas - a colourful traditional turban on their heads. Anjali was offered colourful Rajsthani Odhani (Dupatta) by the viilage lady. The Vidyalaya children recited Vandna and Gayatri Mantra. Children also wrote their names on the board. There were 30 children at the vidyalaya. Sri Brahmomji and Anjali addressed the children in turn and appreciated their learning skills. Children were given sweets by Anjali. Before leaving the village, ladies danced and asked Sri Bhrahmomji and Anjali to join them. They joined and enjoyed it.